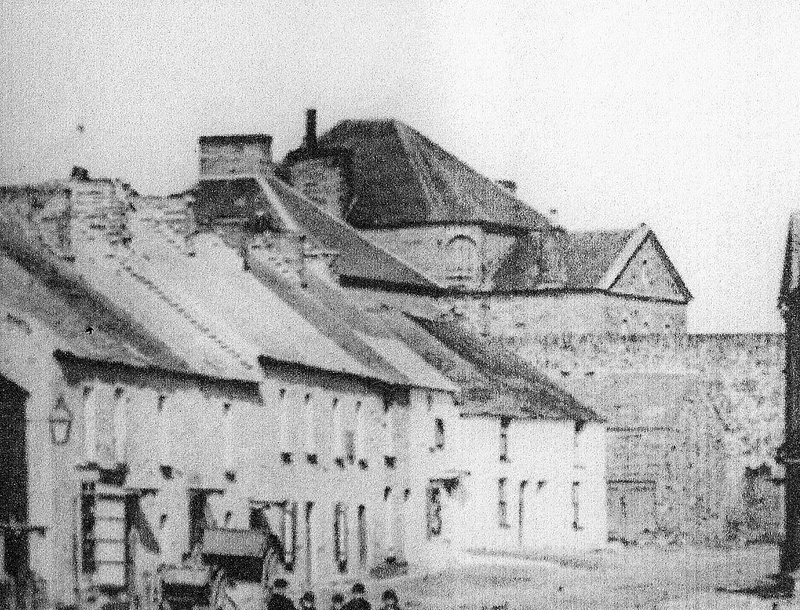 It was discovered that year that the Gaol had been built on land not owned by the County, to whom it was then sold by owner Thomas Johnes of Hafod for £52. 10s. In 1799 new oak doors were installed as the original doors were not strong enough. On 1st November 1799 Gaoler William Langdon appeared at the Assizes accused of allowing Thomas Thomas, a prisoner accused of forging a bank-note, to escape. The case was dismissed. In 1801 John Hammet, proprietor of the Penygored Tinplate Works, Cilgerran, was paid £18.5s. for new iron gates for the gaol. That year the unpopular prison surgeon, John Williams of Newcastle Emlyn, was replaced by Thomas Edward Pryse Jones of Cardigan. John Williams was reinstated soon afterwards with Alexander Bevan as his assistant. On 30th November 1801 there were thirteen prisoners – including six debtors and five felons. In 1803 James Neald visited and described the gaol. His report was published in 1812 and appears below. It contained a kitchen, an office for the gaoler, a Great Hall 38 ft long and 30 ft wide with semicircular ends for the inspection of prisoners, sleeping cells for criminals, four rooms for debtors and a chapel. Above the latter were two rooms for the sick. Neald described it as being all dirty and lacking a water supply. The nearest water was at Pensarnau Well. “…CARDIGANSHIRE. Broke out of Cardigan Gaol, in the night of the 12th instant. Thomas Evans, late of Aberystwith, hawker and horse-dealer, committed for uttering base coin: he is about 36 years of age, and about five feet six inches high; wore a blue frock-coat, leather breeches, and boots; knock-kneed, brown complexion, round face, brown eyes, cocked nose, black hair: T. E. inscribed on the skin of both his arms, with the figure of an anchor, and also a resemblance of a woan, with a glass on one of them. And also escaped at the same time, Richard Morgan, committed for theft, of the parish of Ystrade: he is about 40 years of age, black hair, dark complexion, remarkably short sighted. “…CARDIGAN, South Wales. The County Gaol, and Bridewell. Gaoler, William Langdon. Salary, 30l. Fees, for debtors and Bridewell Prisoners, 6s. 8d. for Felons, tried at the Great Sessions, 13s. 4d. and for the Conveyance of Transports, 1s. per mile. Chaplain, Rev. John Evans. Salary, 20l. Duty, on Sundays: and at other times, if required. Surgeon, Mr. Williams. Salary, for Debtors and Felons, 10l. Number of Prisoners: 1801, Nov. 30th – 6 debtors; 5 felons; 2 Bridewell. 1803, Sept. 26th, 3 Debtors; 1 Felon; 0 Bridewell. Allowance, to Debtors, none whatever. If the Debtor be poor, he must apply to his parish for relief. To the Gaoler, for the maintenance of Felons and other Criminal Prisoners, 4s. 8d. each per week. REMARKS – This Gaol, which is also the Bridewell, was finished and inhabited in 1797, and stands at the North-end of the Town; having in front a paved court, 42 feet by 27, with cast-iron pallisades, which give it a very handsome appearance. On one side of the entrance is the Gaoler’s kitchen, and, on the other side, his office; beyond which, and in the centre of the building, is the Great-Hall, or Inspection-Room, 38 feet by, and four above stairs 30, of a circular shape; It has a flag-stone floor, with two fire-places, and four windows, commanding a view of the four different courts, each of which is 20 yards by 16. Were the Gaoler to live in the Great-Hall, he would then have a full and complete view of the whole Prison, from a point the most eligible for effectual inspection: But at my last visit, in September 1803, I found it filled with corn, and two Men were absolutely threshing it out! The six passages, which lead to the Criminal’s sleeping cells, open into this room. For Debtors here are four rooms on the ground-floor, and four above stairs, each 13 feet by 11, and furnished with fire-places; but no fuel allowed, which had rather a tantalising appearance. Straw is the only bedding supplied by the County for Prisoners of every description. The entrance to the Felons’ ward is at the lower end of the Great-Hall, and forms a detached wing of the Gaol. They have four sleeping-cells below, and four above stairs, each 10 feet 6 inches by 9 feet, and 10 feet 6 inches high. To this wing are attached two small courts, 15 feet each by 11; but as being out of the Gaoler’s view, the Prisoners seldom have the use of them. The Bridewell part of the Prison comprizes twelve rooms and sleeping-cells, about 10 feet each by 8, with loose straw in them to sleep on. The Chapel is properly partitioned off, so that the sexes do not see each other; their respective lobbies leading distinctly to their seats. Over the Chapel are two rooms for the sick, each 38 feet by 30, the size of the Great-Hall below. They are both light and airy, and furnished with fire-places. There is no water laid on to the premises of this County-Prison: The Keeper must therefore fetch it from a well, a quarter of a mile distant: Even the inhabitants purchase water for their own use. No bath: The whole Prison is, and must be, very dirty, till some improvement takes place, to supply the means of ablution and cleanliness. Geese, ducks, and poultry inhabited the court-yards. The Prison is a new structure, of little more than ten years standing. A Lunatick was here confined with a Felon! No particular care seemed to be taken of the maniac; although, probably, by medicines, and a proper regimen, some, at least, of this melancholy description, might be restored both to reason and usefulness in life. In 1814 Rev. John Evans of Llanarth was the Prison Chaplain, but neglected his duties. In 1815 a new Welsh Bible and Testament was purchased for the use of prisoners. In 1816 Gaol fees were abolished by Act of Parliament. In July 1816 Thomas Evans escaped from the Gaol. In 1817, as a result of widespread famine since 1816, the Gaol was full of starving beggars and debtors. In 1817 Rees Rees was paid £4.16s. for installing a small pump to bring water into the gaol. Margaret David and Margaret Richards were paid £1. 16s. “…for attending the sick and keeping clean the different apartments of the County Gaol…” Both women were in gaol themselves for petty larceny. On 21st March 1818 the position of Gaol keeper was advertised and by 2nd May 1818 William Langdon had died. On 20th April 1818 Evan Evans became the Gaolkeeper until 1848. On 16th July 1818 Rev. Griffith Thomas became the Chaplain. In November 1818 a reward was offered for information leading to the recapture of two escapees – J. Meakin and J. Adkins. The pair were caught at Birmingham in January 1819. In October 1821 Will James alias “Big Will” was executed here. In December 1821 three men were imprisoned here for the murder of blacksmith Thomas Evans of Rhydfendigaid – the only murder committed in the area within living memory, according to the ‘Times’. On 20th October 1823 Mary Evans, wife of the Gaol-keeper, became the Matron. In 1824 the “House of Correction” was enlarged to serve the whole county. In January 1825 tenders were sought for building additions. On 25th February 1825 Thomas Noott became the surgeon. On 14th August 1825 Evan Evans, son of Gaol-keeper Evan Evans and Mary Evans, was christened at St. Mary’s Church. In April 1827 a vagrant named William Andrews was hanged here for stealing some old clothes from a house in Aberporth. John Miles, joiner, conducted some repairs in 1828. In 1828 Evan Evans, gaoler, owned shares in the vessel ‘Ruth’, 46 tons. On 15th July 1831 John Evans received £10.13s. for timber for repairs to the goal. On 20th July 1832 Thomas Bowen received £60 for conducting repairs. In 1834 the Gaol was marked on J. Wood’s map of Cardigan. In 1835 Evan Evans was the Governor, Rev. Griffith Thomas the chaplain, and Dr Thomas Noott the surgeon. In 1836 Evan Evans, gaoler, owned shares in the ship ‘Rachel’, 33 tons. On 8th November 1838 John Mathias, joiner of Pwllai, married Evan Evans’ daughter, Maria Evans. In 1839 Evan Evans, governor, owned shares in the Cardigan ship ‘Sarah’, 38 tons. In 1840 Evan Evans, the Governor, leased two cottages on Pendre for demolition and use as building sites, from Philip John Miles of the Priory. On 20th August 1840 Captain John Best Ferrier of Catherine Row married Anne Evans, daughter of Governor Evan Evans. In 1841 the following persons were resident: Evan Evans, 60, keeper; Mary Evans, 60, his wife, matron; Margaretta Evans, 20, their daughter, servant; Evan Evans, 15, son, keeper’s assistant; Mary Jenkins, 15, servant; 20 male prisoners and 2 female prisoners. In July 1841 the Gaol contained 9 debtors and 10 offenders. On 9th March 1843 Mary Anne Evans was christened at St. Mary’s Church. She was the daughter of the unmarried Evan Evans jnr and a single woman named Jane Hasselby of High Street. On 22nd January 1844 Captain Evan Thomas, Master mariner of Aberporth (Master of the ‘Pheasant’, married Margaretta Evans, daughter of Governor Evan Evans. In 1849-70 Evan Evans jnr. was the Governor. On 2nd August 1849 Richard Evans, son of goalkeeper Evan Evans and Mary Anne Evans, was christened at St. Mary’s Church. On 6th February 1851 William Thomas, turnkey, married servant Sarah Lewis, both staff at the Gaol. On 7th April 1851 Mary Anne Evans, daughter of governor Evan Evans and Mary Anne Evans, was christened at St. Mary’s Church In 1851 the occupiers were:- Evan Evans, 25, governor; Mary Anne Evans, 23, his wife; Richard Evans, 1, their son; Mary Anne Evans, 1 month, daughter; Anne James, 21, Nurse; Anne James, 18, house servant; William Thomas, 28, turnkey of the Gaol; Sarah Thomas, 24, turnkey’s wife; Prisoners – Thomas Roach, 21; George Sycamore, 25; David Davies, 30; David James, 14; John Allen, 24; John Thomas, 43; Evan Jones, 46; Edward Samuel, 32; Charles Wright, 21; John Jones, 18; Eleanor Thomas, 58; Mary Williams, 22; David Evans, 55; Owen Owens, 31. In 1851 Evan Evans, governor, owned shares in the Cardigan ship ‘Betsey’, 36 tons. On 28th October 1851 Elizabeth Jane Evans, daughter of Evan & Mary Anne Evans, was baptised at St. Mary’s Church. On 9th March 1852 former governor and father of the then governor, Evan Evans, died aged 72. “…REPORT OF THE GAOLER OF THE COUNTY PRISON. To Her Majesty’s Justices, Sfc. Gentlemen,—I regret that I am compelled to report to you that during the past sessions the number of committals has been unprecedentedly great. Daring the past quarter 66 prisoners have been committed to my custody, and 35 discharged. Thomas Lewis, who was sentenced to a term of 4 years in a reformatory school, was removed to the Stoke Priory Reformatory. Henry Marsden also, who was sentenced to penal servitude at the last sessions, was removed to the Pentonville prison on the 25th November, 1868. The greatest number at any one time has been 48, the daily average 38, and the least number, 33. The prison is clean, and in good repair. I am, &c., E. EVANS. “…REPORT OF THE SURGEON. To Her Majesty’s Justices, Co. Cardigan, January 4th, 1869. Gentlemen,—I beg leave to report to you that the Cardigan county gaol is kept clean and well ventilated. The number of inmates on the sick list has been more than usual during the last quarter, which may be attributed to their being in a state of destitution when committed. William Reynolds, suffering from chronic indigestion, I have been obliged to order him extra diet. I am. Sir., W. L. NOOTT. I certify that the requisitions of the said Act, with respect to the separation of prisoners and enforcement of hard labour have been complied with as far as practicable in the Cardigan County Prison during the quarter. M. ELLIOTT, Governor. On 28th April 1871 new gates were erected. In 1871 the following persons lived here: Michael Elliot, 35, gaol keeper; Fanny Elliot, 35, his wife; Henry M. Elliot, 9, their son; Charles B. Elliot, 7, son; William E. Elliot, 4, son; Blanche B. Elliot, 2, daughter; plus staff and prisoners. On 30th November 1871 Martha Smith Elliot, daughter of governor Michael Elliot & Frances Elliot, was baptised at St. Mary’s Church. On 23rd December 1871 Martha Smith Ellott, Governor’s daughter, was buried at St. Mary’s Church, having died aged just 7 weeks. In March 1874 Rev. T. Jones became the chaplain. On 19th September 1874 Florence Phoebe Elliot, daughter of the Governor Michael Elliott, was buried at St. Mary’s Church, having died aged 1 year. On 16th July 1875 a prisoner escaped, but was recaptured. In 1875 Michael Elliott was the Governor and his wife, Fanny Elliott, was the Matron. Rev. Thomas Jones was the chaplain and Dr. William Lane Noott was the surgeon. On 28th May and 23rd June 1880, sales of building plots and materials were held. A further sale was advertised on 4th July that year. The site is now occupied by Bingham House; Llety Teifi (formerly Stanley House); The Highbury (formerly Highbury & Brooklands); and Belmont. Remaining sections of the Gaol are incorporated within some of these properties. A portion of the Gaol was demolished in October 1898.
part of the original gaol building? either from the east or west wing parts? Thanks again for the kind comments. 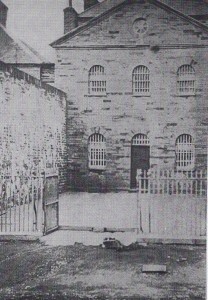 The Central Block of Nash’s Gaol is now the Highbury Guest House – Nash’s original windows, now blocked, can be seen to the rear. The North Wing has gone, the South Wing, heavily refurbished, is Llety Teifi, formerly known as Stanley House. Great research! My grandfather Thomas roger Evans was born at turnpike house which seems to be located next door or at least nearby the gaol. His family is listed just above the gaol inhabitants on the census. Just for fun I looked up Evan Evans governor of the gaol and found your article and the pictures. Very helpful. You refer to prisoner Mary Williams 22, in 1851. Do you have more information regarding this prisoner? She fits the bill for my g.g grandmother… born Caron Is Clawdd 1828. She was sent to the “house of correction” for 6 weeks at Tregaron Petty sessions – The Welshman reports 31 Oct 1856 for leaving place of employment at Dol Fawr House. I presume it is the same place. Hello. Am still fascinated with your report on my Great Grandfathers days at Cardigan Goal. Michael Elliott and his wife Francis. My grandfather was his little boy of 4 years called William . Perhaps I will come and visit from Bath one day again. Have you anymore news of Michael,or a photograph of him please? Dear Glen, if there is anymore information on my Great Great Grandfather ,the last Governor of Cardigan goal .Michael Elliott and his wife Francis please email me. I have been able to follow the family after they left Cardigan when the prison closed and know they retired to Llandudno and are buried nearby. Thank you for all the wonderful write up .wish I had asked my Mother about her Grandfather more before she died. Thank you Glen ,it was lovely to receive a reply. I made a mistake in saying Michael was my GG Grandfather as of course he was my Great Grandfather. How I would like to find a photo of him! I found out from your report that they sadly had 2 daughters die in their time at the prison. There was another daughter born called Gwendoline Francis and they had Martha 2 years later and a son Percy born in 1880. William my Grandfather eventually joined the Royal Navy so left Wales. Gwendoline had a shop of her own near Llandudno with the name Elliott as she never married. The family lived in a Victorian house in Llandudno after retirement ,run as guest house,it still is! But not in our family but the owner would like me to visit. Michael died 2 years after retirement in 1892 with ill health he was 56.and Fanny and 3 of her children ran it then.Martha married a well known business man and is buried with him on the Great Orme. In 1791 John Nash was paid £48.17s. for plans, elevations and estimates for a new Gaol for Cardigan – this was approved in February at the Quarter Sessions. The main contractors were James Rees – mason; Richard Oliver – carpenter; and William Slack of Cheapside – ironmonger. I have 2 burials of ‘Slacks’; Christiana Slack 1740 and Andrew Slack 1741. It could be just a coincidence but Andrew (b1717 Llanycil) may well be the son of William Slack Ironmonger who married in Chester and was listed as ‘Ironmonger of Bala’. I wonder if anyone has any further information to help we trace William and Mary Slack and family.